the surface. The “wheel” is heralded as one of the world’s greatest inventions. But, in reality, it is simply a circular component. In fact, without its counterpart the “axle” it is relegated to being a doorstop (the role of the door is for another article). The wheel gets all the limelight while the axle gets a mere footnote. The wheel with its axle changed the world as we know it. The wheel and axle is one of the “simple six machines,” the others being the lever, the pulley, the inclined plane, the wedge and the screw. rocks, tree branches and clotheslines. 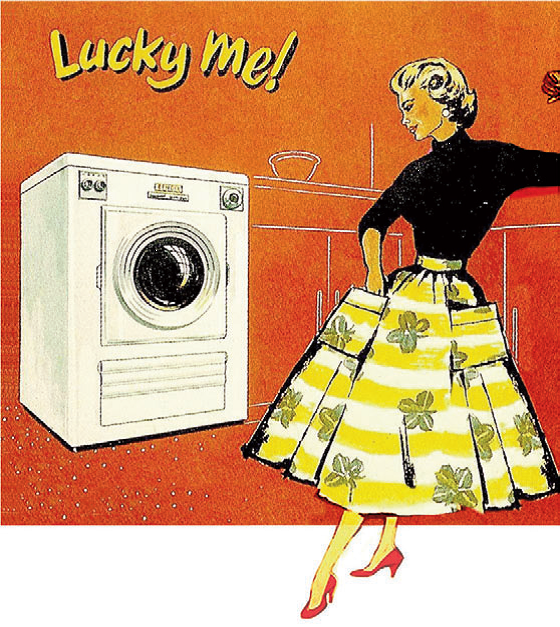 While the electric clothes dryer was introduced in 1915, it was not until the Hamilton Manufacturing Company produced the first automatic dryer in 1938 that the use of the dryer started to become known. Hamilton’s engineers had developed a plain metal box with an electrically powered rotating drum inside and equipment for gas heating. Except for an on/off switch, the machine was featureless and lacked any appeal or soul. The company was having trouble selling the dryers because people did not know how they worked. Hamilton hired Brooks Stevens, an industrial designer to address the problem. The porthole on the dryer was indeed, “newer,” “better,” and “sooner.” The need to see how things work is hard wired in humans. It is the basis of knowledge gathering, problem solving, improvement science, innovation and progress. Case in point: Uncle Milton’s Ant Farm. First introduced in 1956, Uncle Milton’s Ant Farm is a toy industry icon that has delighted generations of families. It allowed children to “see” the underground world and activities of ants through an “observation tank” not unlike a home aquarium. One of the most popular toys was a line of “visible models.” Children were intrigued by assembling models of “humans,” “horses,” and “car engines” with clear plastic covers allowing them to see the parts, their relationships and how they interacted. The early introduction of the “visible models” in early education influenced thousands of children in pursuing careers as physicians, veterinarians, scientists and engineers. The desire and intrigue to see clothes tumbling as they dry, or to understand what is going on inside the box, is the same human drive to understand decisions made that influence and impact the lives of individuals and families (and communities) confronted with intellectual and developmental disabilities. Parents, families, advocates, educators, researchers and professionals are often confounded by policies, mandates and regulations that seem to miss the whole point. In his 87th year, the artist Michelangelo (1475 -1564) is believed to have said “Ancora imparo” (I am still learning). Hence, the name for my monthly observations and comments.